Forecasting earthquakes is one of the most important problems in Earth science because of their devastating consequences. Current scientific studies related to earthquake forecasting focus on three key points: when the event will occur, where it will occur, and how large it will be. In this competition, you will address when the earthquake will take place. Specifically, you’ll predict the time remaining before laboratory earthquakes occur from real-time seismic data. 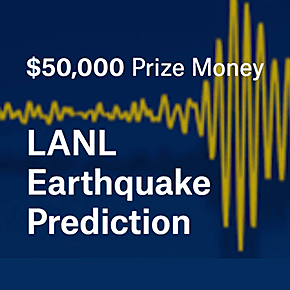 If this challenge is solved and the physics are ultimately shown to scale from the laboratory to the field, researchers will have the potential to improve earthquake hazard assessments that could save lives and billions of dollars in infrastructure.